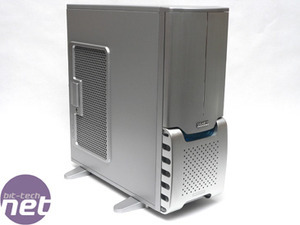 There are several players in the market for high quality computer cases. Some names that immediately come to mind are Lian-Li, Cooler Master, Antec... Gigabyte?! 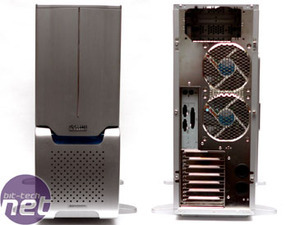 Yes, Gigabyte has expanded into the system chassis arena. Being predominantly a component manufacturer, most folks won’t consider their first offering too seriously. A lot of manufacturers try to round out their product line and add a broad range of products. They tend to compliment the core components the company does well. Unfortunately, in a lot of cases, these complimentary products aren’t considered very carefully and represent a half-hearted attempt at growing their business and come across as tacked-on additions. It doesn’t appear to be the “case” with Gigabyte. 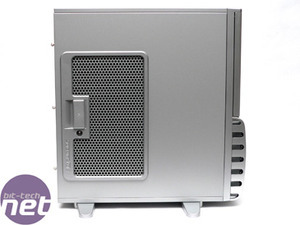 This new case has the initial impression of substantial attention to detail. I respect the fact that they didn’t take the easy way and throw some OEM model into the market and adopt a see-how-it-does approach. This is a serious case design, they are not wading into the water, Gigabyte jumped in screaming “cannonball”! We'll take a look at it in great detail along with another Gigabyte first, their watercooling kit, to see if they've made a big splash or just some ripples. 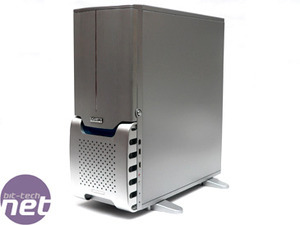 Gigabyte has dubbed the their new chassis design "3D Aurora" (also see GZ-FSCA1-ANS for silver and GZ-FSCA1-ANB for black) and first impressions are that it's a beefy brute of a case. The front features a door. As we've covered in other case reviews, some love doors on cases and some don't, it's totally down to personal preference. Personally, I like the door on the Aurora. It is made from cast aluminum and the fit and finish of the door is nearly flawess. It closes securely with magnetic contact and is the most solid door I've ever seen on a case. There is little chance of it loosening over time like I've experienced with some other case designs. However, unlike the Cavalier series from Cooler Master, the hinge side cannot be changed. It opens from the right and that is your only choice. The back is nickle plated, it looks incredibly sharp. The back also features something I've never seen before, twin 120mm exhaust fans. For the longest time, one of my agendas for a good case was for 120mm fans for the intake and exhaust. 120mm intakes have become the standard for a while now but it seems like manufacturers seem to have had trouble fitting them on the back. Apparently, the dimensions of the 3DAurora allow not only one but two. The side features a vent/window. It has two layers of mesh providing structure but allowing air to get through. Over time this will, no doubt, need to be cleaned for dust.